On stage, in the studio, or anywhere inspiration strikes, the Vx400 vocal effects processor will give you all you need to get your perfect sound. The Vx400 offers you the choice of, multiple vocal "character" selections, modeling of 16 different pro microphones, an integrated drum machine with 30 rhythm patterns, 19 programmable instrument effects and more. But you don't have to be an audio engineer to get the most out of the Vx400. Just plug your favorite mic, guitar, keyboard and CD player in, and you're ready to go. 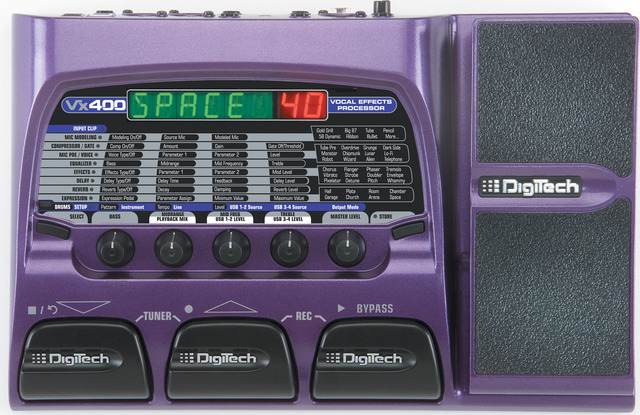 The Vx400 also turns your computer into a professional, hands-free multi-track recording work station. Whether you're working out the vocals for your first song or recording your next CD, the Vx400 gives you powerful, digital studio tools in a simple-to-use package. Connect the Vx400 to your computer with the included USB cable, and you're laying down tracks and mixing your best piece to date. Effects Microphone Models, Compressor, Noise Gate, Mic Pre / Voice, EQ, Chorus, Flanger, Phaser,Tremolo,Vibrato, Strobe, Doubler, Envelope, Pixelator, Detune, Pitch,Whammy™, Delay, and Reverb.